Are you thinking about sending, or do you already have staff or projects in high risk or complex environments? Does your organisation have the correct legal infrastructure for success? Have you assessed your legal risk as part of your overall risk assessment – do you know what legal risk you might be carrying? 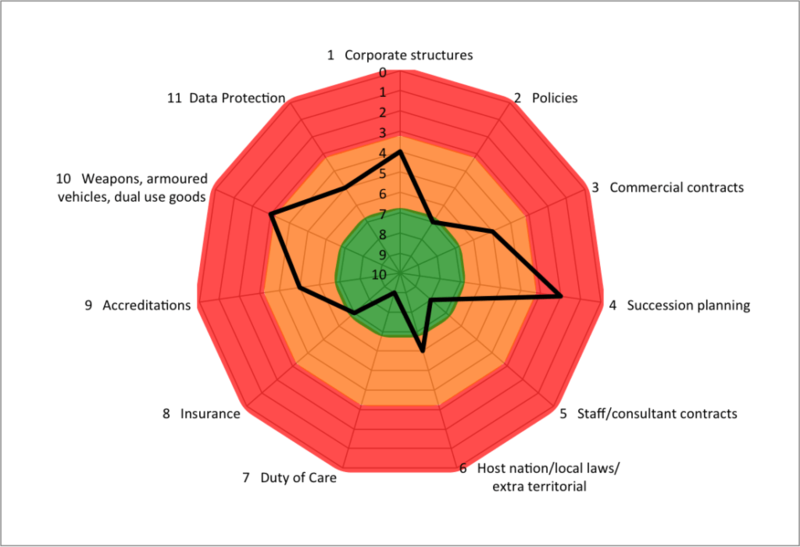 The Proelium Law Legal Risk Map® process looks at your structures and activities from a legal risk perspective, helping you to understand and mitigate any vulnerabilities you may have in this area. The Legal Risk Map® is free, bespoke to each client and is confidential. See an example of the results we send. If you want to understand more, use the button below and complete the online questionnaire and we will send you the results. We also realise you may just want to see what it’s all about, so you can also download the questionnaire to read at your leisure. Theme 1 – Corporate structures and responsibilities, including memorandum of association, articles of association and shareholders agreements or if your organisation is a registered charity or other form of NGO. Theme 2 – Policies, including (for instance): day-to-day functioning of your company; anti-money laundering; anti bribery and corruption; third party suppliers. Theme 3 – Commercial contracts – with third party suppliers and clients. Theme 4 – Succession planning. Theme 5 – Staff/consultant contracts, their rights to work and visas. Theme 6 – Host nation and local laws for overseas projects, extra-territorial laws and sanctions, immigration and tax and work permits. Theme 7 – Duty of care. Essential to limit your exposure to negligence claims. Theme 8 – Insurance and whether it is adequate or not. Theme 9 – Accreditations, whether you would be ready and their usefulness. Theme 10 – Use of weapons and armoured vehicles, dual-use goods (if applicable) and private security companies. Theme 11 – Data protection, to conform to the Data Protection Act and GDPR. WHAT PROBLEMS DOES THIS ADDRESS? Reputations can be irretrievably damaged. As ever, there needs to be balance across a company’s activities to get the ‘tail to teeth’ ratio just right. We have found that among other ‘tail’ activities, such as logistics or HR, the legal aspects tend to be overlooked. This can be because legal language can be impenetrable, there is a fear of cost and there is a perception that ‘legals’ are not required – ‘if we don’t mess up, we don’t need legals’. Each of these views can be valid, but the ‘do nothing’ option comes with risk. We have designed the legal risk mapping service to remove the guesswork from this part of your operations. As ever with risk, once it has been identified it can then be mitigated or accepted for what it is; the crucial first stage, though, is to identify the risk and that’s what our legal risk mapping process does. We will ask you about your business, about your services and about any goods that you supply. Once we have reviewed everything, we will provide you with a legal risk map, showing where you are in relatively good shape and where we believe you may be carrying risk. We also provide a prioritised work plan to mitigate any risks we have identified. The time and cost of the legal risk map depends on how deep you want us to go. Our free legal risk map takes an hour of your time (and about a day of ours) and provides an overview of your situation. You may decide that you want a fully detailed map or that you want us to focus on certain areas; in either of those cases, once we understand a little about you we will charge a set flat fee. DO I HAVE TO TAKE THE ADVICE? WHAT IF WE DON’T AGREE WITH YOU? Of course you don’t have to act on our advice. We would say, though, be wary of cherry-picking the parts you like and ignoring the ones you don’t (or seem to be ‘too hard to do’) as you could create more problems than solutions. We will distinguish where we are pointing out a statutory requirement from where we suggest good practice. IF YOU FIND SOMETHING THAT IS WRONG, WOULD YOU TELL ANYONE ELSE? No. Whilst at the initial stage we are not providing legal advice, it is an assessment of your current situation and we will treat all of our correspondence as confidential. We would never divulge details of our correspondence to a third party. If, following the initial stage, you ask us to deal with the areas highlighted you may be entitled to legal professional privilege. IF YOU FIND A LOT OF ACTIONS, DO WE HAVE TO USE YOU TO SORT THEM? You don’t have to use us as there is absolutely no obligation attached to the risk map. We do, though, believe we are best placed to help companies in our areas of specialisation. Another law firm is unlikely to just take our views without checking themselves, which means more time and expenditure for you. I AM WARY OF EXPOSING MY BUSINESS TO ANOTHER COMPANY, EVEN IF IT IS A LAW FIRM. This is quite understandable but rest assured the purpose is not to cause embarrassment, it’s to make sure you are set up (legally) for success. There are an army of law and regulatory requirements that even the best structured companies don’t know about or just don’t do very well. You are rightly focused on the delivery of your goods or services, let us focus on your legal infrastructure. Also rest assured that we immediately delete your information if you do not wish to give us instructions afterwards. 1. Take the questionnaire – complete the simple to follow online form below (takes approx. 20 -30 minutes). 2. Download the questionnaire – if you don’t have time now, download the Legal Risk form to complete later. 3. Contact us to discuss the service – to discuss the legal risk map service, and how it can put your company onto firm legal foundations for continued success, please contact us on +44 20 3875 7422 or email law@proeliumlaw.com. Get in touch and we will guide you through the process – it won’t take more than an hour plus it’s free. We’ll get a slot in the diary for a conversation, following which we will send you your legal risk map.